Day 34 – Following the value chain – quinoa cookies! 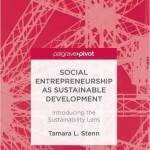 Home / Blog / Day 34 – Following the value chain – quinoa cookies! 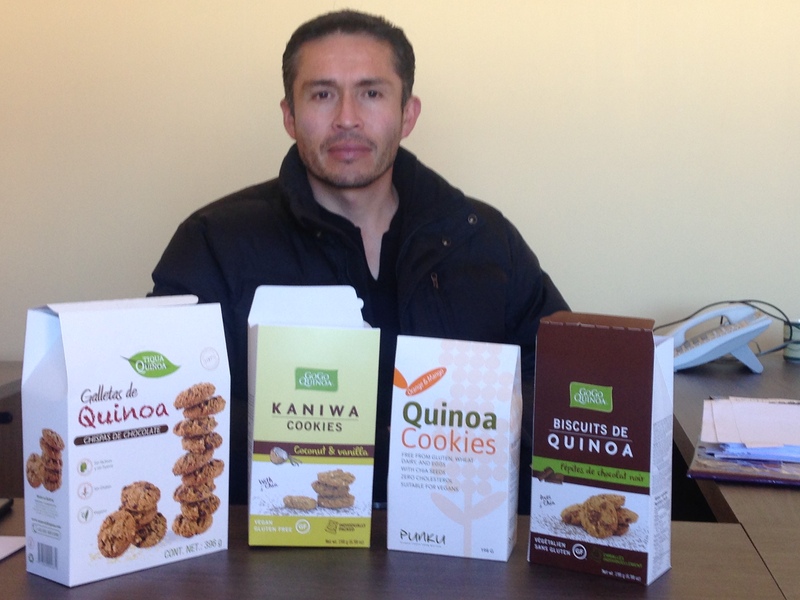 On my way off to Bolivia last month, the kids slipped a few boxes of quinoa cookies made in Bolivia that they had found on the discount shelf in our local grocery outlet store. $2.99 was the discount sale price, though I do not know what the original price was. We had had these cookies before, Andean Dream, coffee flavored. Each 2″ size cookie came individually wrapped in foil. There were maybe 30 cookies in each box. I had originally banned the cookies from our snack shelf because of the packaging, it was too much garbage. Though the cookies themselves were flavorful enough, nice and crunchy. But as a special treat for our Bolivia trip, I let a few boxes of the cookies slip into our suitcases. It is always fun to show people in Bolivia how their products end up in other countries. I was pretty certain there were no Andean Dream cookies for sale in Bolivia. Working on the quinoa story in Bolivia and following the value chain for the bulk quinoa grains made me wonder what the value chain for that box of cookies was. I asked Juan Pablo of Quinoa Foods if he knew. He suggested that La Francessa or Coronilla, two well established Bolivian food processing companies with national and international sales, could have made them. I had worked with Coronilla in 1997 on an export project for their quinoa noodles but La Francessa I did not know. Coronilla was in Cochabamba 12 hours away. La Francessa was right here in El Alto, La Paz so I visited them first, Andean Dream cookie box in hand. Here I met with Edson Alba Lavayen, the Executive Director of Exports. He looked at the cookie box with curiosity and a bit of confusion. Years ago he had produced cookies for this company but sales were slow and after a while ended altogether. It seems they had changed manufacturers and was now working with Coronilla. This box of cookies was not his. However, other cookie boxes were. For the past nine years, La Francessa, a 57 year old company, and the country’s first mechanized cookie maker, had been exporting gluten free quinoa cookies all over the world; to France, Mexico, Germany, England, Chile, U.S. and Canada with brand names such as Vivir Bien, Punco, Mesonot, Gogo Quinoa, Costco and 10 other smaller, lesser known names. Founded in 1958 by a family of Lebonese immigrants, La Francessa had humble beginnings as a bakery specializing in bread and hand made cookies. Now with 45workers, 80% of which are women, they just received gluten free certification for an entire cookie processing plant. Currently they are exporting four containers of cookies a year to the U.S. but with the new plant, they have the capacity to export 12 containers. They are looking for new clients and hope to soon have a deal with Whole Foods. Edson had hoped I was a new client. When he realized I was doing research on quinoa value chains and not placing bulk export orders for cookies, he was not dismayed. Edson explained how his cookies were made of 25% quinoa with tapioca, rice, and kanawa, another Andean grain that is good for the stomach. Though not certified organic, they were made of all natural, nationally sources ingredients. Edson explained if there was enough demand from his buyers for an organic cookie, he would develop one, though so far there had been no requests. La Francessa offers 12 different cookie favors though chocolate chip is the most popular, accounting for 80% of all sales. La Francessa buys raw chocolate from El Ceibo, a Bolivian Fair Trade association that produces the country’s best chocolate, and makes their own chocolate chips customized for their quinoa cookies. Much of their quinoa is from Jachay Inti, Juan Pablo’s quinoa processing plant. La Francessa makes their own quinoa flour to the exact consistency needed for its cookies. The result of using such carefully sourced, customized ingredients is delicious. La Francessa is also known as a good place to work. They provide professional development training, are SCORE certified in safety and quality control, and have an excellent customer service record. I was dismayed to see that the cookies were exported in bulk, individually wrapped in plastic and packed into large sacks. The cookie export buyers place these pre-wrapped cookies in their own cookie boxes and sell them under their own name. When I asked why the cookies had to be pre-wrapped, Edson explained that it kept the cookies from rubbing against each other and crumbling apart. I voiced my concern about the waste packaging and Edson agreed it was a problem, but he could not come up with a better solution yet and his clients did not mind, so he was going to continue to use it for now. Perhaps I’ll give my students a case study of developing a market for quinoa cookies in the US. I’m hosted by pair.com – they are fantastic! Thanks – working on keeping it interesting!